The FCS-1 and the FCS-2 weigh and fill 1 to 20 lbs. of chopped, shredded, diced, batched and small whole vegetables. Some examples are lettuce, diced onions, stir-fries, cole slaw, chili peppers, celery sticks, florets and more. 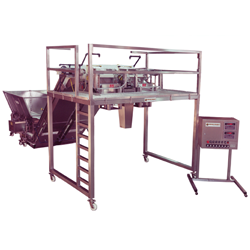 These systems have a Live Bottom Bin (LBB) to receive product from a spin basket or other source. 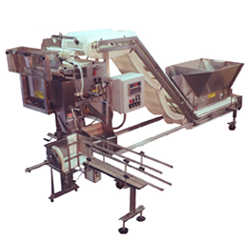 The LBB has a slow moving conveyor that feeds product first-in-first-out to the incline conveyor which delivers the product at a controlled rate to the scale head. The product is moved to the weigh bucket using bulk and dribble belts filling 98% of the desired weight quickly and the last 2% at a slow rate using the dribble belt only. Once accurate weight is reached the product is gently and quickly ushered out by a push plate to ensure a clean discharge into the package.